When I am having a wardrobe crisis, I can be heard uttering that most plaintive of cries ‘I have nothing to wear’. Naturally if I peer into my closet there are umpteen sartorial possibilities, so when I use those words, what I really mean is usually one or a combination of the following. I have gained or lost 3 kilo and absolutely nothing I own fits me. I am addicted to buying black, despite the fact that it looks so wrong against my pale Celtic skin. In a fit of hormonal madness, having read in one of the fashion glossies that unstructured acid yellow garments are the coming thing, I have ‘invested’ in some new clothes. Naturally they looked gorgeous on the tall tanned willowy blonde models in the magazine but everything is lost in their translation to my five foot three frame. I have attempted to buy clothes that will do double duty for work and the other parts of my life. In the cold light of day I find they are either too frou-frou for work or too austere for casual wear. We are having an extended heat wave in Ireland (not at the moment unfortunately). All of my clothes purchases were made in the belief that this will never happen and I genuinely have nothing to wear! What do you mean when you declare that you have nothing to wear? 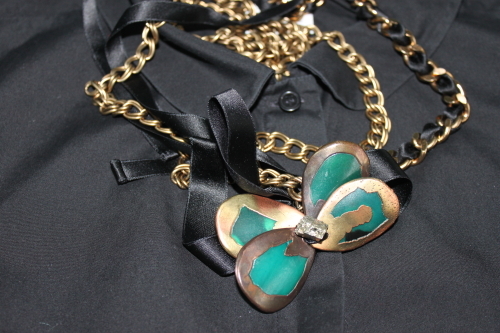 Note; the blouse in the photograph is Agnes B and the necklace Marni.